At A Hearing For Bowe Bergdahl, The Focus Is On President Trump : The Two-Way The Army judge, Col. Jeffrey Nance, posed the question of whether the sergeant could receive a fair trial after comments made by the president, who has repeatedly called Bergdahl a traitor. U.S. Army Sgt. 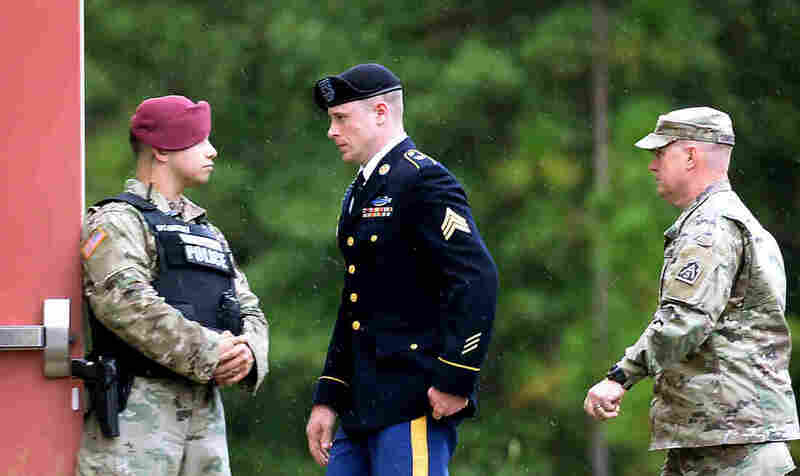 Bowe Bergdahl (center) is escorted to the military courthouse at Fort Bragg, N.C., on Oct. 16, the day he pleaded guilty to desertion and misbehavior before the enemy. The military judge handling the case of Army Sgt. Bowe Bergdahl suggested that recent comments by President Trump could raise questions about the fairness of the legal proceedings. At a sentencing hearing Monday, Army Col. Jeffrey Nance spent the better part of an hour on the subject, reports NPR's Greg Myre. This was in response to a renewed motion by the defense to dismiss the case. The defense argued that remarks by Trump last week constitute "undue command influence" on the court-martial. Under the military justice system, it's unlawful for commanders to influence legal cases, or even give the appearance of influence. That principle covers the president as commander-in-chief. Bergdahl, who spent five years in Taliban captivity, was a frequent target for Trump when he was a candidate. Trump suggested in 2015 that Bergdahl "should be shot," as NPR's Rebecca Hersher reported. In previous filings, lawyers for Bergdahl cited at least 45 instances where candidate Trump called their client a traitor. As president, Trump had stopped talking about Bergdahl until last Monday, when Bergdahl pleaded guilty to desertion and misbehavior before the enemy. "I can't comment on Bowe Bergdahl," Trump told reporters last Monday. "But I think people have heard my comments in the past." Greg reports that the hearing recessed after an hour owing to a family emergency of one of the prosecutors and will resume Wednesday. He adds that Nance did not indicate how he would rule on the defense's motion. "The judge has very wide discretion in this case. He could sentence Bergdahl to life in prison or he could let him walk out of court a free man, saying in a sense that the five years he spent in Taliban captivity is punishment enough," Greg reports. "And that seemed to be what Bergdahl's lawyer was getting at, that Trump's comments should have some impact on the sentencing and should not lead to any further confinement." When asked by the judge if he wanted to withdraw his guilty plea, Bergdahl declined. "June 2009: Bergdahl is captured by the Taliban after leaving his base in southeastern Afghanistan. Almost immediately, questions arise about the circumstances of his capture. "May 2014: Bergdahl is freed in exchange for five Taliban detainees who were being held at the military prison in Guantánamo Bay, Cuba. "March 2015: The U.S. Army charges Bergdahl under two sections of the Uniform Code of Military Justice: Article 85 (Desertion) and Article 99 (Misbehavior before the enemy)." U.S. personnel were injured in the search. Greg reports that those soldiers are expected to testify during an upcoming hearing.